In today’s bountiful data ecosystem, marketers face a real challenge to reach the right customers. Dealing with isolated pools of data scattered across tools and channels creates real roadblocks to the process of defining and targeting the perfect audience. Luckily, advances in technology offer a solution. 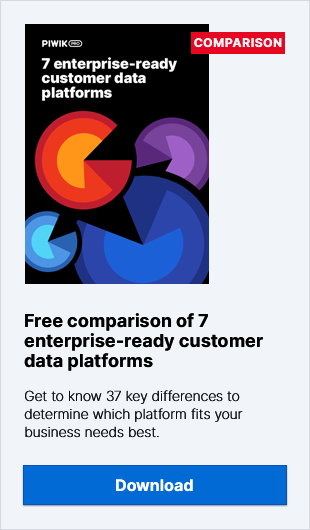 The name of the game here is “customer data platform.” Employing both first- and third-party data sources, this tool lets you build highly customizable audiences to reach the exact customers who want what you’re selling. The question is, how can this be done efficiently? In this post we’ll give the answer to this question and show how a CDP carry the day. What is successful audience targeting? Before we explain how to use a customer data platform for successful audience targeting, we need to define success in this context. Effective audience targeting means you engage with visitors and customers in a way that draws them to your brand. You’ll get them to convert, either by spending money on your product or by signing up for your services. And if you want to make your targeting work, you need to specify the attributes of a particular audience and the dimensions you should apply to better define it. That’s the key stage of building a precise audience in your customer data platform. However, creating a pinpointed audience to ease targeting is no easy feat. One of the changes marketers face is data silos. Your technological arsenal, whether it’s web analytics or DSP, is very limited, and it handles fixed data, which makes it hard to to create precise audiences. You can address this problem by employing a customer data platform that lets you collect data from multiple sources and then apply it to create accurate custom audiences of your choice. Knowing your users and customers is crucial, because your site visitors and app users are a very diverse bunch. They can be differentiated by a myriad of attributes. Your task is to pick the ones you need to build a targeted group. So, you can decide if your audience is comprised of iPhone or Android users, middle-aged people or teenagers, pet owners or families with kids. Also, you can select an audience of either homeowners or renters, either city dwellers or residents of rural areas. Or perhaps you want to divide your audiences into people who do the shopping only on weekdays and those who prefer to hit the mall on Saturday mornings. In short, you can examine practically any detail about your prospects and customers to find the proverbial needle in the haystack. To keep up with the ever-changing digital landscape, marketers need to employ innovative strategies that mostly involve embracing new software and tools. That’s precisely the case with customer data platforms. This technology, which is still maturing, is an indispensable element in the smart marketer’s arsenal. A CDP delivers a range of benefits. One of the key advantages is that a CDP facilitates integration of data from a range of first-party sources. That is essential for pinpointing bespoke audiences. The accuracy and complexity of your audience translates into high-precision targeting. What’s more, with these carefully chiseled audiences you can employ what’s known as “segment of one” or “audience of one” tactics. The idea behind this method is that you can create a very specific audience of individual customers, and that paves the way for personalization and one-to-one marketing. You’re able to focus your efforts to address the needs of a particular prospect or client. So, CDPs solve the problem of data integration as they merge all customer touchpoints into a single record. Different departments in every organization handle their own data sets. Marketing keeps data in web analytics and ad platforms. On the other hand, the sales team with customer success has their data stored in CRM and live chat. It helps you connect all these sources and stitch your fragmented data bits together, working across channels and devices. In this way, pieces of information like first-party data, purchase history, transactional details, web and in-app actions, and engagement details are merged with third-party data on buying habits and customer interests. What’s more, the unified data lets you create a single customer view, a principal source of information for effective personalization and informed decision-making. Audience targeting requires you to build 3D persistent customer profiles. That’s why a single customer view is a must-have. Also, CDPs by default are created to let marketers work in real time. It’s one of the strongest points of this technology as every single action taken by your customers is reflected in updated and enriched profiles. Furthermore, it gives you the potential to act on fresh information straight from the platform. Last but not least, another advantage of a CDP is that it’s fueled by first-party data. For marketers and advertisers, this is the most essential and invaluable data. It comes directly from your customers and visitors, meaning you can expect it to offer the greatest precision and reliability. At the same time, first-party data translates into legal compliance, keeping you aligned with GDPR and ePrivacy. As the data is obtained directly from customers, you have both 100% ownership and full control. However, having the right to certain data is not only a regulatory matter. Consider your Facebook and Google Analytics campaigns. Of course, both platforms provide you with audience targeting, but that comes with a price. Your options are limited – using visited URLs or items in a cart is not enough. Not to mention that you would have to work on separate data sets. Building such intricate audiences isn’t possible if you use Facebook, Google Analytics or any other similar tool separately. That’s where the CDP delivers considerable advantages, by integrating a range of tools and data sources. As a flexible and interconnected piece of software it can be easily linked with every element of your marketing stack. Whether it’s analytics, CRM, an e-commerce platform or any other piece of software, they all work smoothly when partnered with a customer data platform. Can you imagine just how much this powerful tool can advance your audience targeting? The answer is – a lot! Have a look at how you can use it to target the right audience. As we’ve already mentioned, not all your prospects and customers are equal – that’s why you can’t provide all of them with the same content. You should take advantage of audience segmentation and pay attention to the segments mostly likely to respond to your offer. Put it differently, focus on customers and prospects who will bring value to your organization. The most receptive segments most likely will generate higher customer lifetime value in the long run. While there are many tools on the market that can help you with this job, the problem is that most of them let you create only generic segments. This is where a CDP has no equal, as it lets you apply data from multiple sources like analytics, CRM, email marketing platforms, transactions, communication choices and so on. Consequently, you can precisely divide your targeted audiences by creating elaborate and accurate segments. As you can see, by using a CDP you can slice your segments razor-thin. This will significantly boost the promotional reach of your ads and offers, targeting the audience that is most likely to respond to your offer. Once you know your customers and prospects inside-out, you can start to tailor your offers. Bespoke offers are what really resonate with the preferences and tastes of people within the orbit of your products and services. The way to do it is personalization. With an ideal customer in mind and personalization techniques at your fingertips, you can tick all the right boxes with your product or service. This is where a CDP is a perfect fit. As we’ve already mentioned, it helps you make your audiences as granular as possible and implement a “segment of one” solution. In other words, you treat an individual user as your audience and provide one-to-one personalization. Let’s say you run an online store with photography and electronic equipment. As soon as a customer enters your website, they’re immediately recognized – you already know they bought a Nikon camera two days ago. It’s time to act on this data and provide a customized offer. Display a banner ad with a bag specially made for the camera, or send them an email offering a discount on a tripod for their specific model. You could also give your customer a link to a blog post reviewing lenses for the new camera. Get the most out of your data and user profiles to tailor your content and make your message come through. With personalization, you can wield more influence through targeting your audience with a compelling message. In other words, one that sparks visitors’ interest and resonates with your prospects and customers. Make them feel like you know them and value their needs. Satisfy their expectations so they’ll stick with your brand. How Can You Take Advantage of Predictive Personalization? Organizations that want to act on customer data instantly and provide personalized experiences need advanced technologies. The kind that let them spot customer signals and use them to deliver perfect content. A customer data platform does exactly that. It’s a flexible and interconnected piece of software that merges all kinds of data aggregated across your digital channels and helps you address customer needs with an individual approach. Consider an example where a CDP proves its value in e-commerce. Let’s say you want to upsell ski helmets to customers who have already bought a pair of skis in your store. With chiseled customer profiles you can use the platform to create an audience of first-time buyers who previously responded to your “welcome campaign.” You need to work across platforms to make it more efficient, as users tend to jump from one channel to another. In this case, you can prepare upsell campaign emails, as well as run on-site, Facebook and Google Ads to convert these customers into “second-time buyers.” You can offer them an additional discount if they complete a second purchase within the next 3 days. Audience targeting is an intricate process. To be successful, it requires you to get thorough, in-depth knowledge of your customers, followed by putting this information into action. That involves a lot of time and effort, and seizing each opportunity that comes along. It might seem like a hard nut to crack, but with the right marketing solutions like analytics and a customer data platform you can pull it off in style. We hope we’ve provided you with valuable information about audience targeting in tandem with a CDP. That said, you’ve probably got some more questions, which is why we’re here to help. Reach out to our Piwik PRO team and we’ll give you all the assistance we can.